Evie O'Neill has been exiled from her boring old home town and shipped off to the bustling streets of New York City - and she is pos-i-tute-ly thrilled! New York is the city of speak-easies, rent parties, shopping and movie palaces, and soon enough Evie is running with glamorous Ziegfeld girls and rakish pickpockets. The only catch is that Evie has to live with her Uncle Will, curator of the Museum of American Folklore, Superstition, and the Occult - also known as 'The Museum of the Creepy Crawlies'. When a rash of occult-based murders comes to light, Evie and her uncle are right in the thick of it. Even Evie's new pals - hoofers, numbers runners and activists, but all swell kids - are drawn into the investigation. And through it all, Evie has a secret: a mysterious power that could help catch the killer - if he doesn't catch her first..."
Thank you to Allen and Unwin for supplying me with a copy for review, this in no way influences my review. All opinions expressed are my own. When I requested a copy of The Diviners for review I had intended to publish it through out my Halloween Spooktacular. But life got in the way and I had to take a break from blogging, read more about that here. But I am finally getting around to it so here we go. I love the Australian cover (as above), I like it more than the American cover. I don't know what it is but it just intrigues me. The colouring is very 1920's and it all just fits well with the idea of the book. Evie has been up to her antics again, but her parents just can't take it anymore. She gets carted off to live in New York with her Uncle. And she is oh so upset about it. Not. She couldn't be more excited to make her way to New York and live an exciting life in the big city! Evie has a special gift. By touching a personal object of someone she is able to see things about them. She can tell you things about yourself that you never told anyone before. No one can figure out how she does it and she claims its just trick. A chance encounter with a pick pocketer and a killer ghost has readers of this story on the edge of their seat. The ghost of a twisted killer is awakened and starts again at his old ways. Evie's Uncle owns and runs a museum, which allows them to investigate the recent murders. With Evie's ability and her Uncles research skills they find themselves mixed up in the mess and suspected of murder. I'm not a big fan of historical reads, I'm much prefer books that are set in modern times. However, The Diviners is an exception. Though this is set in the 20's flapper era, I didn't find that this was the focus. Libba Bray skilfully moves beyond the time setting of this story moves past the time setting and focuses on the plot, and it is an excellent one at that. This was the first book of Bray's that I have read, and I was not disappointed! 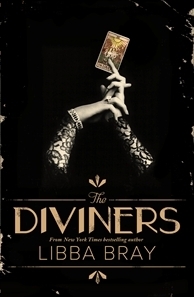 I highly recommend The Diviners to all book lovers for a truly unique and intriguing read. Oh yay I can't wait to read this! Glad you liked it, so many people have been raving about it!